In this page, we have uploaded the PDF documents for Web Mining Seminar report. Also, Download the Web Mining PPT presentation for seminar and study. As the web and its usage continue to grow, the opportunity to analyze web data and extract all manner of useful knowledge from it also growing simultaneously. 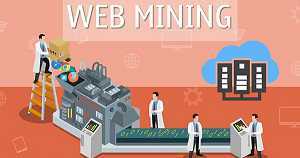 The past ﬁve years have seen the emergence of web mining as a rapidly growing area, due to the efforts of the research community as well as various organizations that are practicing it. We have uploaded two PDF documents for Web Mining Seminar Report which discusses the concept, applications and the fields of web usage mining, which are the direct needs for the growth of the World Wide Web. The PDF paper for Web Mining Seminar report is titled as Web Mining - Concepts, Applications, and Research Directions authored by Jaideep Srivastava, Prasanna Desikan, Vipin Kumar from the University of Minnesota, US. In this seminar report, they have brieﬂy described the key computer science contributions made by the ﬁeld, a number of prominent applications, and outlined some areas of future research. Our hope is that this overview provides a starting point for fruitful discussion. In this seminar report, it describes the data-centric view of web mining which is deﬁned as "Web mining is the application of data mining techniques to extract knowledge from web data, i.e. web content, web structure, and web usage data." Another PDF paper for Seminar report titled as Web Mining by Sandra Stendahl, Andreas Andersson, Gustav Strömberg, will look closer to different implementations on web mining and the importance of filtering out calls made from robots to get knowledge about the actual human usage of a website. This seminar report primarily focuses on the field of web usage mining, which is a direct need for the growth of the World Wide Web. Here, we have uploaded two Web Mining PPT which explains that Data mining: turn data into knowledge whereas Web mining is to apply data mining techniques to extract and uncover knowledge from web documents and services. The Web Mining PPT further discusses the taxonomy, Web Content Mining, Intelligent Information Retrieval, Intelligent Web Search, Clustering etc. Second PPT mainly focuses on Web Mining Overview, Basic Web Analysis Problems, Data Warehouse Solutions.